A new Missal app tailored for Australian congregations, including local readings and responses, has been released for Android devices. Source: Catholic Voice. The Missal App has readings for Australia Day and ANZAC Day and, after being tested in Australia for five years, has been approved for use by the Australian Bishops Commission for Liturgy. The Missal App allows a book (more than 3000 pages) to be stored on your device for easy access, even without Internet availability. It has been released by the Masso Foundation, named after Mgsr John Masso, a Spanish-born Opus Dei priest who served in Australia, New Zealand and the Pacific Islands from 1967 until his unexpected death in Spain in 2003. The foundation supports a range of formative, educational and outreach activities, in particular those inspired by Opus Dei. David Bolton of the Masso Foundation said that he hopes The Missal App will help Australian Catholics get the most out of Mass and that the foundation was grateful for the generous donation of the royalties for the sale of The Missal App. 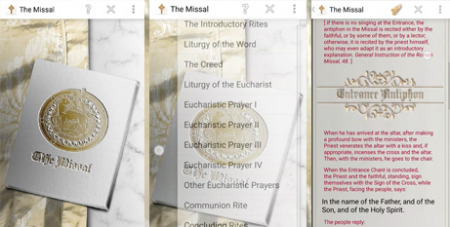 The Missal App uses smart selection by accessing the calendar on the Android tablet or mobile phone to automatically select the correct prayers and readings for the day and provides multiple options where there is more than one feast for that day. It even switches on a Saturday afternoon for the Vigil Sunday Mass and includes other celebrations such as Nuptial Masses, votive Masses and Masses for the dead. It is available for use on Android devices from the Google Play store for $4.99.